Christmas may not be a holiday I officially celebrate, but folks, that won't stop me from playing Nat King Cole's holiday album, wearing my best snowflake sweaters (I have two), and baking a counter full of cookies. I'll leave the Nativity bit to others, but the kindness, the cheer, the mistletoe, the sweets - that stuff is open to anyone. Which is why I'm participating in a Secret Santa Secret Cookie Swap, because who doesn't want to gift and be gifted on the holidays? The mystery recipient of my goodies better get some goat cheese ready, because I'm sending over a jar of my tomato jam, some homemade tangerine marmalade, cinnamon-pear maple syrup from Napa, and a little box of can-I-just-say-they're-adorable sablé cookies filled with homemade dulce de leche. But that's not all: I firmly believe that we all need to expand our holiday baking horizons beyond cookies. Why insist on mailing containers of very breakable cookies or often-teeth-cracking biscotti when you can pack a tin full of dense, chocolatey, travel-friendly fudge to your loved ones? Or better yet, surprise them - and save on shipping costs - by sending the lightest, fluffiest, still-sturdy marshmallows ever made. Because I am moderately obsessed with anything maple-flavored (excluding extract and Aunt Jemima - the real deal, people), I swapped corn syrup and some of the sugar for a yes-I'm-serious whole cup of maple. Worth it, and you know what? Next time, I might even add half a cup more. I also added freshly ground cardamom, one of my favorite spices. The fresh ground bit makes a difference; if you have whole nutmeg but no whole cardamom, use nutmeg instead. In a pinch, I'm sure pre-ground cardamom would taste good, too. More Marshmallow Ideas: Don't stop at maple and cardamom. Try adding some gingerbread spice and a tablespoon or so of molasses for gingerbread-flavored marshmallows; swap water for port or reduced cider for fruitier treats; or, of course, sprinkle some cocoa and grated chocolate during the final mixing for chocolate confections. Just remember that it's called the season of giving, not the season of stuffing your face with marshmallows. Save at least a few for your friends and family. A note about cardamom: you need to remove the brown seeds from their green pods before grinding. Some specialty stores sell the cardamom seeds without their pods, making this job a bit easier. If you have fresh cardamom in the pods, no biggie - just turn on some music and get rolling. Butter the bottom and sides of a 13x9-inch baking pan (metal and pyrex both work) and dust bottom and sides with powdered sugar. In bowl of a stand mixer or a large bowl, sprinkle gelatin over 1/2 cup cold water, and let stand to soften. In a 3-quart heavy saucepan, cook sugar, maple syrup, the second 1/2 cup of cold water, salt, and cardamom over low heat, stirring with a wooden spoon, until sugar is dissolved. Increase heat to medium and boil mixture, without stirring, until a candy or digital thermometer registers 240°F, 8-10 minutes. Remove pan from the heat and pour sugar mixture over gelatin mixture, stirring until gelatin is fully dissolved. With stand mixer or a hand-held electric mixer, beat mixture on high speed until white, thick, and nearly tripled in volume, about six minutes if using stand mixer or about 10 minutes if using hand-held mixer. If it doesn't whip up as quickly, be patient - it'll get there eventually. In separate medium bowl with a clean whisk/beater, beat egg whites until they just barely hold stiff peaks. Add vanilla. Beat egg white mixture into sugar mixture until just combined. Pour mixture into baking pan and use a stiff spatula to scrape as much of it as you can into the prepared pan. Sift 1/4 cup powdered sugar evenly over top. Chill marshmallow, uncovered, until firm, at least three hours, and up to one day. Alternatively, set them on the counter overnight and they'll firm up just fine. Run a thin knife around edges of pan and invert pan onto a large cutting board dusted with a bit more powdered sugar. Lifting up one corner of inverted pan, use your fingers to loosen the marshmallow mass and ease onto the cutting board. 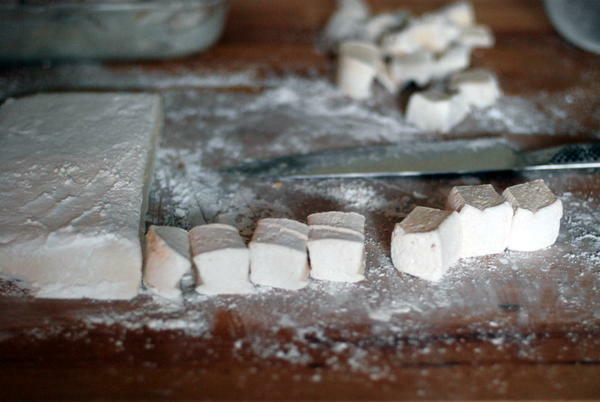 Use a large knife to trim the edges of the marshmallow, and cut into roughly one-inch cubes. (An oiled pizza cutter works well here, too.) Sift most of the remaining powdered sugar back into your now-empty baking pan, and transfer the marshmallows back into the pan. Dust with the last bit of powdered sugar, then roll the marshmallows through it, on all six sides, before shaking off the excess and packing them away. Do ahead: Marshmallows keep in an airtight container at cool room temperature for at least one week, possibly more - if you can keep them around that long.